Blondie and Brownie: The Rock Center Discount Returns to Pret! Pret is my go to coffee joint in the Rock Center area. Why? Let's see, their coffee is fairtrade, rainforest Alliance and organic and roasted within 14 days so it's fresher (and more importantly...stronger). And their milk is all organic, too. Oh, and did I mention that it's cheaper than the 'Bux, for stronger organic coffee and no Starbys line drama? And now with the discount it's even cheaper than before. If you work in Rock Center you need to contact someone in your HR department about getting a card if you don't have them already. I have one somewhere, but most places will give you the discount if you flash your building ID or say you work in the building. 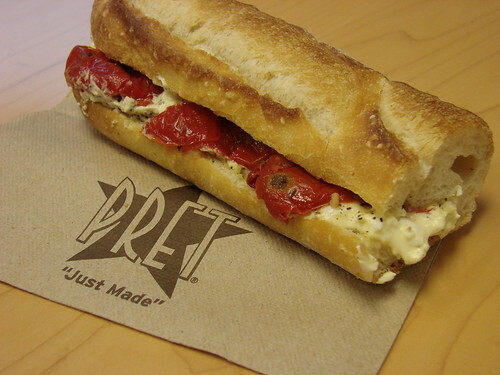 My not so new obsession at Pret is their breakfast baguette with egg salad and roasted tomatoes. Let's pause for a moment to discuss how roasted tomatoes make everything taste better. Lawman and I first discovered roasted tomatoes aka semi sundried tomatoes in Ireland. Basically it's a sundried tomato that's not dried all the way so it has some of that squishy, juiciness and then it's soaked it olive oil. Sundried tomatoes are too sweet for me and they remind me of those tough years in the late 80s, early 90s when sundried tomatoes were all but unavoidable. Semi-sundried tomatoes on the other hand are heaven. This little sandwich provides a nice spin on the usual egg breakfast sandwich and holds me over to lunch. It's $2.99 plus tax, but with the Rock Center discount it'll run you just under $2.99. 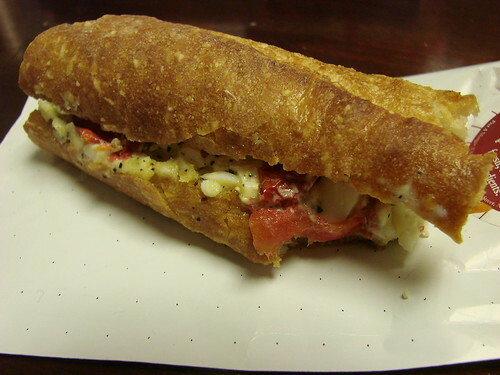 For the more carniverously inclined they also do an egg salad baguette with bacon.